Preliminary reading User Form multiplication example with TextBoxes containing repeated code for the Change event. This module shows how to simplify the TextBox code with the use of the Controls object. 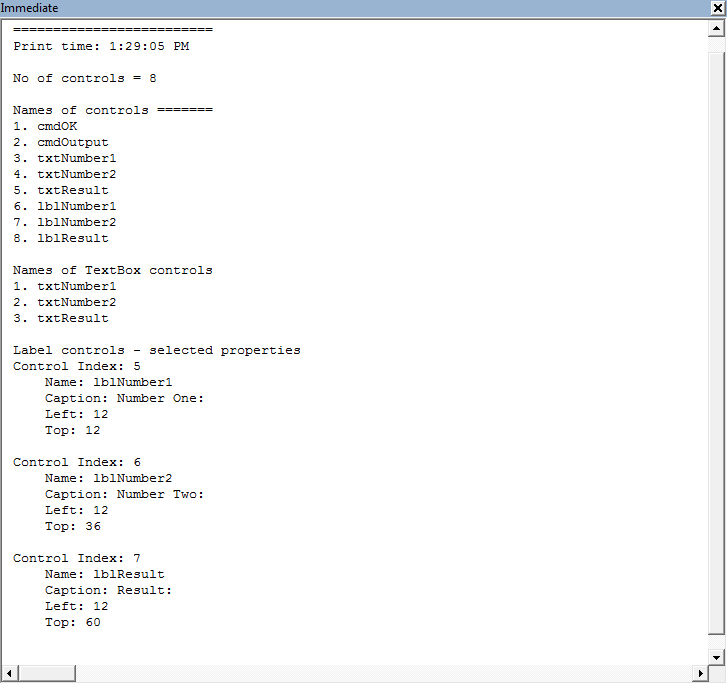 Controls("txtNumber" & Num) = ""
See section 5 for more information about the Controls object. Line 64: This code is located in a normal module (Multiplier). The Show method displays the FrmMultiply UserForm, and the vbModeless property allows the user to switch to Excel and move the ActiveCell while the UserForm is still open. Note: is most cases a user form is Modal, meaning that it must be Unloaded or Hidden to allow the user to continue their task. This section demonstrates the Controls collection. Members can be returned by Controls(index), where index is a zero base integer, or by Controls("name"), where name is the control name such as txtNumber1. Debug.Print "Names of controls ======="
Debug.Print vbNewLine & "Names of TextBox controls"
Debug.Print vbNewLine & "Label controls - selected properties"